You probably don`t remember my films with my kids` performances 10 years ago. Kids dance on various occasions, sometimes just for fun. Great American music for Jeanne! I really enjoyed watching all of these videos! The kids do a great job, and they are so full of energy! This one is my favorite! Take Me Home Country Roads isn't exactly a cowboy song...it's more country/folk with a Bluegrass influence; but I like the cowboy hats anyway! I sent the link to my oldest daughter. This song was her "anthem" when she packed up and moved to West Virginia a few years ago. She stayed there three years. It's a beautiful state! Now that I listen to it again, I like it very much, too. Nice music to dance to, with this drum section, sounds more modern than typical country. Not bad, but I prefer kindergarten version. BTW, I recall reading the review of John Denver`s album in a magazine for young people around 1980. I just read and forgot it because that type of music wasn`t my genre, but I liked the countenance of the singer, he looked so boyish. Ooops, I cannot say much about West Virginia without googling. The only association I get about Virginias is plantations and slavery there. But probably West Virginia differs from Virginia. )Not bad, but I prefer kindergarten version. I really liked John Denver's music when I was young...actually, I still do. Unfortunately, he died in a tragic plane accident when his experimental home-made airplane crashed into Monterey Bay off of California in 1997 at age 53. He co-wrote the Country Roads Take Me Home song as well as singing it. I find it so amazing that years after his death his work is still reaching places such as a kindergarten in Poland! West Virginia also differs from Virginia in its geography...it is very mountainous and not widely suitable for farming/plantations on the scale of Virginia. Many of the mountains are continuing ridges which go on for miles. One can leave the main road in the valley and take a mountain road that continually climbs for miles before reaching the destination. 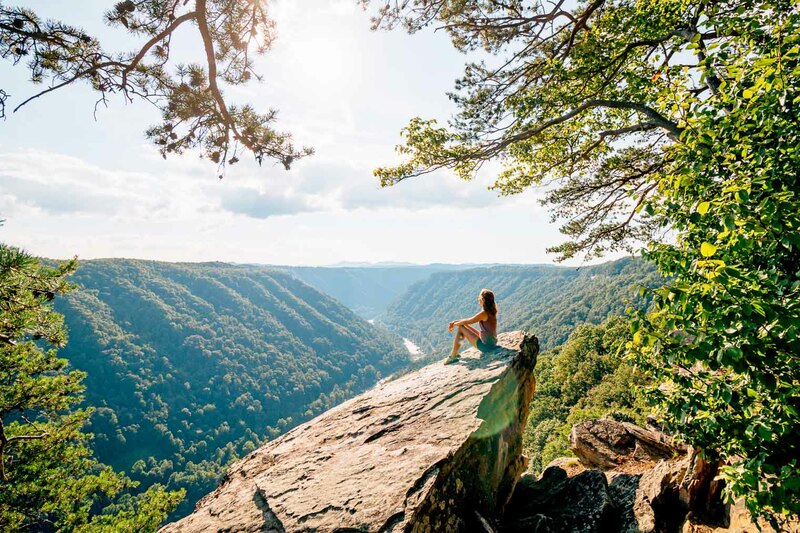 It's a pretty state, and to quote John Denver, "Almost Heaven, West Virginia..."
When politicians promise to revive sth, it usually means scam. You probably mean Haven. Safe haven in the secluded mountains. Nope, I mean Heaven; as beautiful as Heaven...a heavenly place! This photo does give a good sense of the mountain ridges that run for miles! It's very different from the single individual mountains that I'm used to seeing in Vermont. Ridges are great, so regularly flat. From what I heard about US and the political correctness there, I guess dads- with- daughters dance is rather imossible there. It only corroborates the fact that stereotypes about countries/nations are never fully true. In fact, I was speaking to a friend yesterday who told me her grown son attended a father/daughter dance with his two young daughters just this past Saturday evening! Great that there are people who stand up and fight for their rights despite social limitations. I definitely think children in American schools need to do more dancing...it's good for the body and the soul! Sadly, something like dancing is seen as "stealing time" from the subjects of reading and math in our schools...it's all about raising test scores. Polish schools have a similar attitude to dancing. The films I posted are from kindergartens. Jeanne, you said Take Me Home Country Roads isn't exactly a cowboy song...it's more country/folk with a Bluegrass influence; but I like the cowboy hats anyway! But they do wear hats in a clip below. Yes, they do wear cowboy hats in this clip, however, this is a very odd video depicting characters in the wrong place and during the wrong time period for the song "Country Roads." It is definitely a setting in the western part of the U.S. during the time of the "Wild West" (with a gun-fight, horse drawn wagons, etc.) which makes the song an anachronism within the video. The song says "the radio reminds me of my home far away..." Radios did not exist as part of the wild west culture! Signs in the town pictured here say "Lubbock." We know there is a Lubbock, Texas, with Texas being a western state with a cowboy culture. The lyrics of the song speak of WEST VIRGINIA, which while it has the word "west" as part of its name, is located in the eastern most part of the U.S.! The Blue Ridge Mountains and Shenandoah River are also mentioned, landmarks of the eastern U.S. This video is the authentic use of the song. It shows scenes from W.Virginia and the Blue Ridge Mountains. Ok, I admit it now, it is fake cowboy music! Thank you for your humble admission!